Bilingual books are wonderful tools to help create a bridge between languages. They give teachers the opportunity to educate children in the school language, while at the same time they foster an appreciation for the home language. Bilingual books encourage parents to continue using their home language, knowing that it will benefit, not detract from, their children’s school language learning. Below are 10 tips on how teachers and parents can use bilingual books in the classroom and at home to help children excel in language skills as well as to encourage cultural appreciation. 1 ) Teachers read bilingual book out loud in the school language while parents read the same book out loud at home in their language. Did you know that parents who read to their children in a home language can actually help strengthen their children’s academic skills? It is true! This is in addition to many other benefits, such as strengthening the parent-child bond through shared language and culture. 2 ) Teachers read bilingual books in the school language and show the words written in the other language. Teachers can use bilingual books not only to introduce students to languages that use the Roman alphabet, but also to those languages such as Arabic and Chinese that use different symbols and characters. Seeing that languages can be written using a variety of letters and scripts helps children understand that sounds and words can be represented in diverse ways. As the teacher reads the bilingual book aloud, she can point out the different words or symbols in the second language. 3 ) Read bilingual books that highlight different cultures. When teachers select bilingual books that focus on different cultures, traditions and customs, they are helping children feel comfortable with cultural diversity. It is a gentle way for teachers to cultivate multicultural awareness and appreciation in their students. 4 ) While reading the story in the school language, pick out a few key words in the other language. The idea here is to stimulate curiosity and interest in language, not to confuse the students, so keep it to a minimum. By periodically using words from other languages, the teacher shows the students that an effort is being made to understand their languages. When we make this kind of effort, it indicates that our students’ languages are of value and worth learning. 5 ) Parents or volunteers read a bilingual book to the class in one language. Have parents of the students volunteer to read bilingual books in their languages out loud to the class. Afterward, the teacher can read the same book out loud in the school language. This strengthens an appreciation of family and community in the classroom, and provides parents the opportunity to offer something in which they are experts: their language. If parents are unwilling or cannot volunteer, find other teachers who know the language and can read the book out loud. 6 ) Encourage students to write their own bilingual books. After reading a number of bilingual books out loud, work with students to help them create their own bilingual books. They will feel empowered by the fact that they can speak more than one language. Even if they can’t read or write yet, teachers and parents can work together with the students to write down the words in each language while the child provides the pictures for each page. 7 ) Allow children to pick out bilingual books from the school or public library. Having the option to choose our own books is very empowering. Teachers and parents should contact their school and local libraries to find out if they have bilingual books available to borrow. 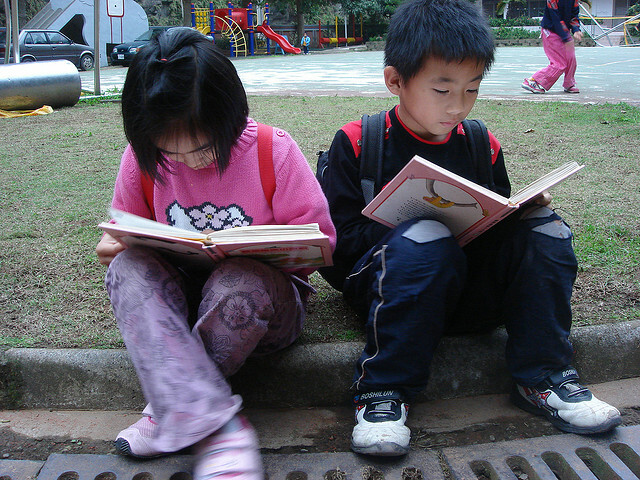 Teachers can also develop classroom “lending libraries” with bilingual books. The benefit of having children pick out bilingual books is that both family members and teachers can engage with children using the same books. 8 ) Ask questions and encourage discussion in both languages. Bilingual books provide the opportunity for discussion on the same topic in more than one language. Teachers can promote discussion in the school language while parents can encourage it in their language. Teachers can send home a list of discussion topics for parents to utilize at home if they wish. Meanwhile, parents should feel encouraged to share conversations from home about the target bilingual books with their child’s teacher. 9 ) Encourage children to read bilingual books in both languages. If children can read in both languages, then they should be encouraged to do so, even if one language is stronger than the other. In fact, understanding the story in the stronger language can promote comprehension in the weaker language. Teachers and parents can help this language transfer by encouraging students to read the stories out loud to them as much as possible in each language. 10 ) Bilingual books provide an opportunity to have fun with language. Having fun with our languages is the most important part of language learning and utilization. Bilingual books provide a springboard for this on many different levels. Discussing the various topics, the words, the different written scripts, and the funny letters in a language’s alphabet are just a few ways teachers can make languages fun and exciting for their students. Parents can help their children learn about the school language by asking questions about words, pronunciation and more in the bilingual books that their children bring home. In our effort to reach language mastery, we often forget that enjoyment is the most important ingredient for language success. These are just a few ideas on how to use bilingual books with children in the classroom and at home. The goal is to help our children embrace all of their languages so that as they grow they will be able to use these languages with confidence and pleasure in the many multilingual and multicultural situations in which they may find themselves. Reading and enjoying bilingual books is one great way to help our children achieve this goal. Want to use this article in your blog, e-zine or web site? Contact Language Lizard President and Founder, Anneke Forzani. I use bilingual books not only for my children, but also for myself. It’s a great way to stay fluent whilst not living or having anybody to communicate from my home country ( Czech Republic). What a great point, Russell! It is wonderful to have bilingual books available for adults and children. I find that reading my children bilingual books out loud is as much fun for me as it is for them – what a win-win situation all around! Thank you for sharing your comment with us! Great tips for parents and teachers! Very useful! I am always looking for great bilingual books for my classroom and home! I will definitely share this with parents and teachers that I work with! 🙂 Helpful tips! Passing it along and Thank you for sharing. One thing my son likes is to find a book with a character he loves. It makes him so much more eager to listen to the story in a 2nd language . Very helpful tips for parents and families. I can’t wait to pass along.